it is quite and well past an emergency. We need to think of Freedom from Fluorosis. How long will it take Safe Water and Nutritional security for all? The history of Fluorosis in India goes parallel to that of independent India. Since the late 1930s when Fluorosis was first discovered in Prakasam, we have come a long way. We now know of this disease in 22 states and 200+ districts. And it is growing. Where did we go wrong? How long do people wait for freedom from Fluorosis? It is wrong to say that the Indian Government has done nothing about Fluorosis. In fact there has been significant expenditure by government programmes. It started with the Nalgonda technology based treatment plants from 1970s. These were developed by the Central government institute called NEERI. Then UNICEF in the 1980s and 1990s developed and promoted along with IIT Kanpur, the smaller de fluoridation units for families. These were distributed in lakhs in Rajasthan and Andhra Pradesh with numerous other players also promoting these. All these finally led to two other responses, one is large scale regional surface water based pipeline schemes and the Reverse Osmosis (RO) plants, both of which started gaining ground after 2000. The Central government also started a National Programme for Prevention and Control of Fluorosis (NPPCF) in 2010 under the Health department. These and others are quite a handful of significant interventions and to say that they have produced no impact would be wrong. They have all worked, but very importantly in short duration. None of them have produced a lasting impact and things have repeatedly gone back to Business as usual. First and foremost, is the need for well grounded Communication. We need to accept that Fluorosis is a slow and long term disease. It needs sustained habit changes of people. That needs local contextual messages in appropriate medium to be constantly targetting people instead of one time measures. These messages also need to change with time as people transform their habits. Secondly is the realization that there is a need for both Safe Water and Nutrition to go together for people to benefit. As has been found, Fluorosis patients suffer from multiple disorders and some of these require nutritional improvements such as those of Calcium. Combination of Safe Water and Nutrition has been found to give visible benefits to affected people. These measures can be bought together by district level centres such as the DFMC of Nalgonda and Balasore. 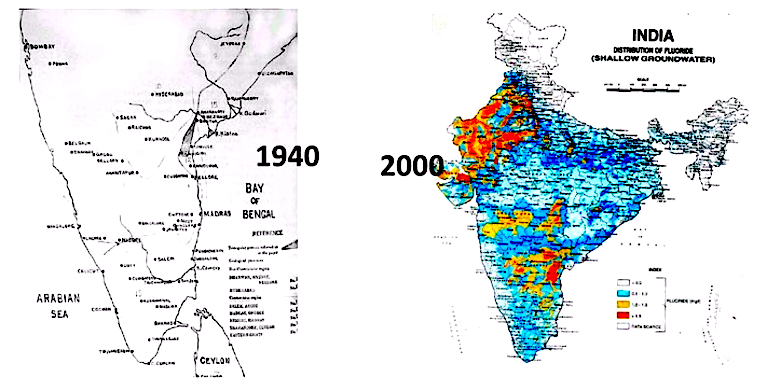 As we enter the 80th year of Fluorosis discovery in India, it is quite and well past an emergency. We need to think of Freedom from Fluorosis.